Daniel interprets the strange handwriting on the wall. 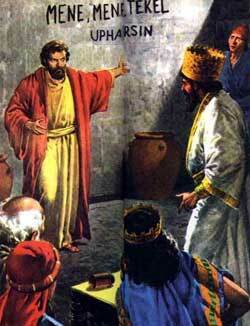 GREAT FEAST was being held in the palace of Babylon. The king, Belshazzar , had invited a thousand princes and nobles to enjoy the feast with him and his many wives. And the palace was ringing with their voices and laughter and song.